LG announced the LG 360 Cam, a 360-degree spherical camera. 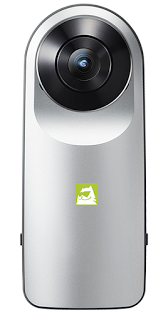 It uses two fisheye lenses back to back in a camera with a compact form factor, similar to the Ricoh Theta. Each fisheye lens has 13 megapixels, although LG hasn’t specified the resolution of the final image. At this time, LG has not yet announced pricing or availability.